I normally read relatively modern history books, since they contain the most up-to-date information and latest discoveries and theories, and I never really expected to have my mind blown by a book written almost 40 years ago. But as I'm writing this I am still missing some metaphorical pieces of my mind, which exploded after reading The Tartar Khan's Englishman. Gabriel Ronay has done something very rare in this book, investigating and writing about an enthralling historical subject that has never been studied before, and has not been studied since. His historical detective work brings to light one of the most bizarre and fantastic stories of the Middle Ages...the rogue Englishman who worked as a spy and diplomat for the Mongol Empire. This incredible episode was basically forgotten over the course of history. There are very few known references to it and, according to Ronay, it was only by chance that he found one of them and began the quest to uncover the identity of the Englishman and learn more about his life. Ronay was uniquely qualified for this endeavor, as his command of languages is almost as impressive as the Englishman he studies, and most of the primary sources he cites have never before been published in English and appear in this book as his own translations. As I read this book I was mortified to realize that I had no idea the Mongol Empire invaded Europe in the 13th century. I've read pretty extensively about this period in Europe, and I had never even heard about it. The Mongols (or Tartars, as they were called by Europeans at the time) built an empire under the famous Genghis Khan that included over 40 modern countries (including China) and was the largest adjoining land empire in history. My knowledge of Eastern history is lacking, I know, but I was shocked to learn that the Mongols conquered Russia and the majority of Eastern Europe in the 1240's and slaughtered tens of millions of people, and I had never known! Shame on me. And shame on the Mongols, who were pretty merciless in their invasions and quest to conquer the world. A first-hand witness wrote that the Tartars ate the dead bodies as though they were "delicious cakes", and that the old and deformed women were fed to the "dog-headed cannibals" but the beautiful women were deflowered until they died of exhaustion. Then the priests were roasted alive and the nuns and maidens were ravished in the churches in front of their families. It seems a little excessive, even allowing for exaggeration! 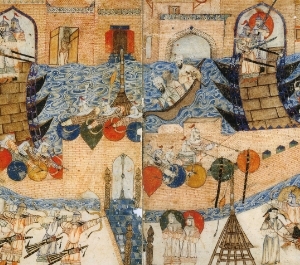 The Mongol invasion of Baghdad in 1258. Where are all the cats and birds? The crazy thing is that this massacre and invasion was aided by a native Englishman who worked for Batu Khan (Genghis' grandson) as an intelligence agent, ambassador, and translator. He was at the heart of the Mongol Empire by 1224, a full 50 years before Marco Polo became famous for traveling there. Through painstaking historical detective work, Ronay follows in the footsteps of this mysterious and crafty Englishman and attempts to reconstruct his early experiences and what led him to turn coat against all of Christendom. His search takes the reader from an England under King John on the eve of the Baron's Revolt and the Magna Carta, to the Holy Land during the 5th Crusade, and to the inner workings of the Mongol Empire. Ronay's deductions are sound and his theory for the identity of the Englishman is very believable and well-supported by evidence. However, there are so few facts to work with and the truth can most likely never be proven at this point. I had to be cautious while reading to distinguish his asserted facts and his suppositions, because they are often written the same way and some of the things he says don't seem to be based on evidence at all (he doesn't really do textual citations). But regardless of whether every fact is correct, this peculiar story is true, there really was an Englishman who joined the Mongol invasion of Europe in the 13th century. And whether Ronay has finally put the right name to this incredible character or not, he does an amazing job describing the backgrounds the Englishman would have recognized, educating the reader on political issues and what life was like in 13th century England, the Middle East, and Asia. I never knew, for example, that Genghis Khan's idea of a brilliant war strategy was to besiege a walled city and then offer to leave them alone in exchange for 1000 cats and 1000 birds. When the understandably confused townspeople agreed to this, Genghis Khan set all of the animals on fire and then released them into the town. While the soldiers were trying to put out the unavoidable fires set around the town, Genghis Khan could break through their defenses. I also never knew that Genghis' son, Ogedei Khan, was an alcoholic. Apparently his minister tried to get him to stop drinking by demonstrating how a piece of iron corroded in a glass of wine. He finally agreed to cut his wine intake in half, but then changed his mind and had to order brand new goblets for the imperial court that were twice their normal size so it would look like he was keeping his word. Hmm, sure, I bet they were all fooled, big guy, you're a master of deception! 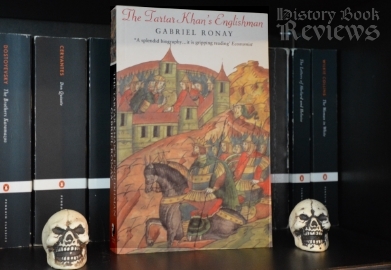 The Tartar Khan's Englishman is truly one of a kind, and as far as I can tell it is still the only book to study this amazing piece of history. The night I started reading it I actually had dreams about it all night, trying to figure out who the Englishman was. This book, and Ronay's investigation through time, is so compelling that it often seems more fiction than fact. Nonetheless it is factual, and Ronay makes it exciting and thrilling to explore the history surrounding this enigmatic Englishman. It is quite literally the book of my dreams. Robert Fitzwalter was the leader of the Baron's Revolt against King John in 1215, and he is discussed at length in Ronay's book. He was one of the signers of the Magna Carta but, even more importantly, he is famous for having instituted a curious custom in England. One day a year, couples who had been married for one year and one day traveled to the lord's manor and stood before a trial. If they could claim that they had not quarreled or repented their marriage, or wished they had married someone else, the manorial lord presented them with a side of bacon. Yes, bacon. The custom continues to this day in some areas of England, and it is believed that this is where the phrase "bring home the bacon" comes from.